Its the little luxuries around our homes that make them spaces we love to spend time in. 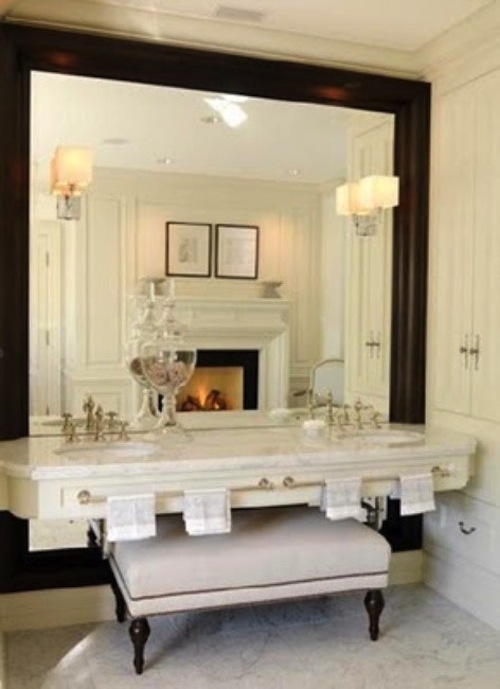 add a large mirror that you love. thrift one, paint one you have stored in your garage- or if you want it to be that one statement piece, find one you will have forever! a chandelier. an ultimate statement of glamour, you can find chandeliers for as little as $35 at Ikea. pretty curtains. 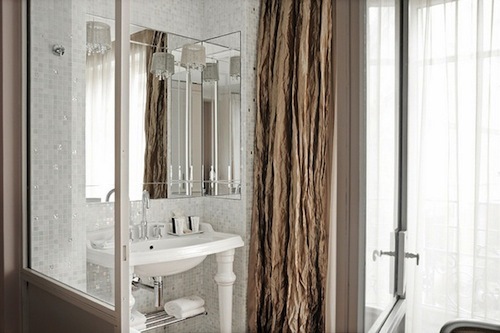 if you have windows, or instead of generic bath curtains, find a drapery the looks and feels sumptuous! ...or choose a tub with character. make a special little spot for yourself. reupholster an existing bench you have around the house, add a little vanity-top, and use a few pretty containers for makeup brushes, a tray for perfumes, etc. flowers. isn't every space a little prettier with some blooms? finally- a well stocked bathroom. its nice for you and your guests to have everything you/they need provided right there in the bathroom. 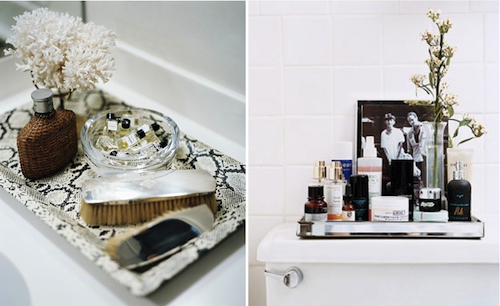 trays are great for a little styling, and a freshly folded pile of white towels is inviting. All of the bathrooms are so amazing. 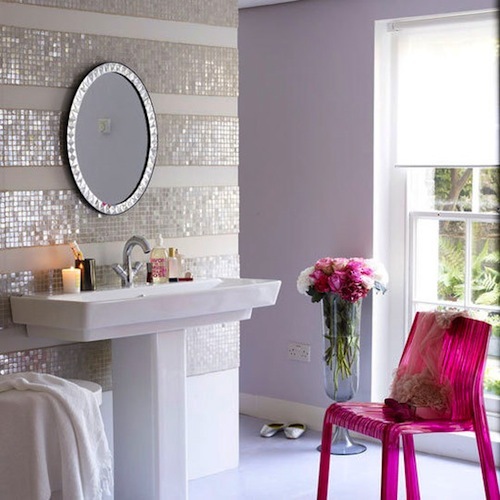 Hard to pick a favorite but I really LOVE the top bathroom and the sparkle bathroom!! 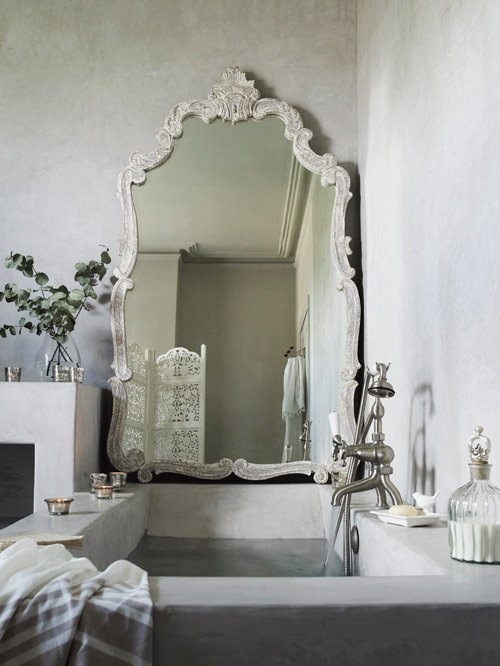 I love that massive square mirror that covers a whole wall, but yet is still a standalone mirror. Very cool! Great ideas! I'm going to start with the tray and towels today! good stuff, good ideas. good post. The walls on that 4th photo down is GORGEOUS!!! So very glamorous! 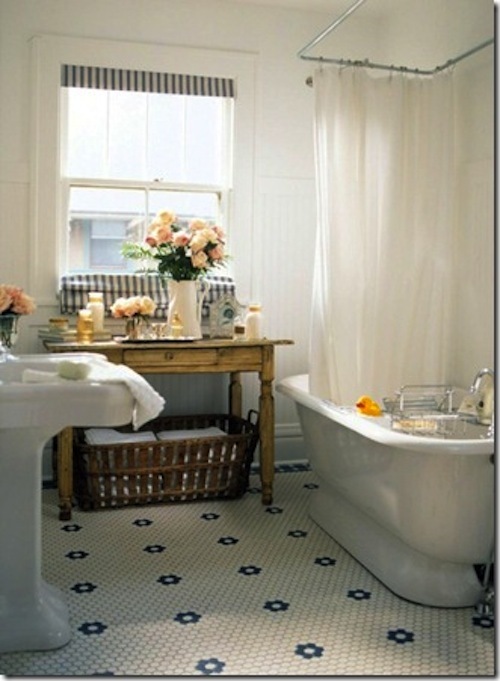 Love, Love, Love the bathroom with the mosaic stripes!! Absolutely darling!! The bathroom with the sparkling tile is absolutely gorgeous. 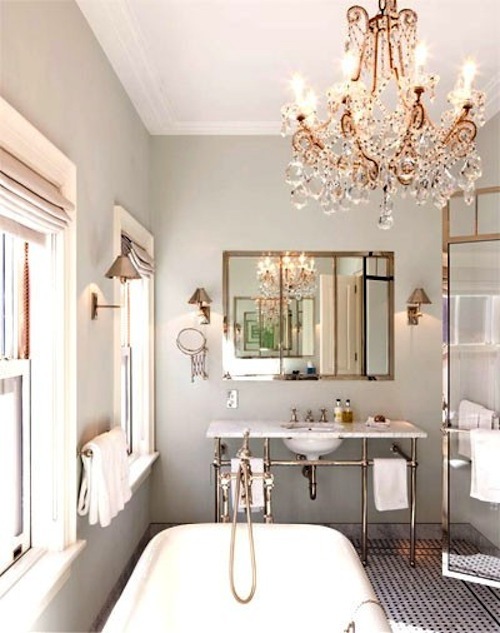 Adding a chandelier in our bathroom was one of my favorite things! love this post. the pink sparkles and the vintage mirror are my faves! I think I'm going to look for a vintage mirror around as my next project!